Thursday was a victory lap of sorts for Mulally, Ford and Fields, who will succeed Mulally on July 1. Thursday was a joyous day at Ford Motor's global headquarters. Chairman Bill Ford sat on the dais between the man who saved the family company -- outgoing CEO Alan Mulally -- and Mark Fields, the man charged with leading Ford into the future. There were smiles, hugs and standing ovations all around. Employees and journalists had just witnessed a rare thing indeed -- the apparently harmonious transfer of executive leadership at a Detroit automaker. The man sitting at center stage seemed to be fighting back tears at times. Who could blame him? He’s losing a wise counselor, friend and miracle worker. But he’s also putting the enterprise that bears his family’s name in what he sees as a safe pair of hands. 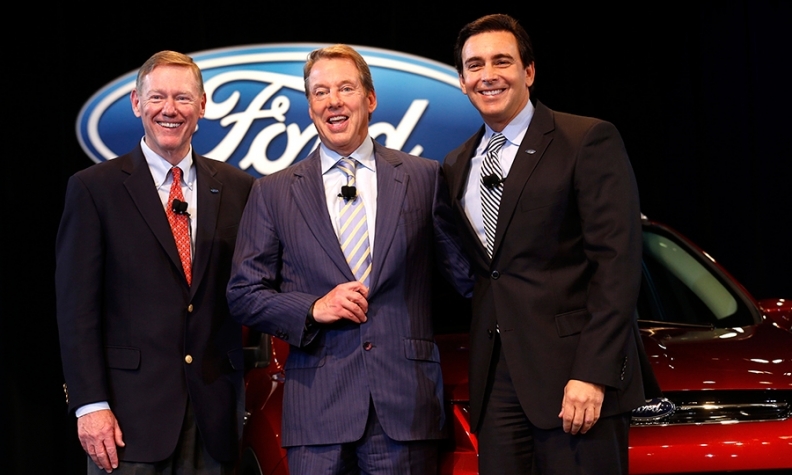 Nobody knows better than Bill Ford just how badly such handoffs can go. He was frank about his company’s tortured heritage. "If you look back at the history of our company, maybe we’ve never had a smooth transition all the way back to my great-grandfather," he told an auditorium full of employees and journalists. Henry I refused to relinquish the reins to his son, dismissing Edsel’s creative, innovative impulses, scorning what he perceived as his decadent lifestyle and eventually driving Edsel to despair. He died of stomach cancer in 1943 at age 49, though some felt the real cause was a broken heart. Only after Edsel’s wife, Eleanor, threatened to sell her public shares did Henry I back down from his plan to put the thuggish Harry Bennett in charge of the company, and hand the reins to his grandson Henry Ford II. In 1978, Henry II fired his most talented executive, Lee Iacocca, who took his talents to Chrysler. At the turn of the last decade, Bill Ford himself had to dismiss the flamboyant Jacques Nasser who had expanded Ford into a bloated, unwieldy, unfocused empire. This morning, Ford paid tribute to Mulally for ensuring that this time, Ford Motor Co. won’t have to go through one of those tortuous transitions of days gone by.